Alfa Laval’s fully automated Beer dealcoholizers are plug-in solutions that remove alcohol efficiently and gently in a single-pass to produce full-flavoured beers. They are designed to help brewers tap into fast-growing and profitable low and no-alcohol beer market as people search for healthier options. The modular design makes it simple to add non-alcoholic brewing capability without the need for major capital investment. Alfa Laval has more than 25 years of experience in the production of both 0.0 beer and <0.5 % ABV beer and is the world leader in stripping column technology. Our range of beer dealcoholizers comes in three standard capacities: 10, 50 and 100 hl/h. They can be configured to recover and dose aroma from the feed beer back into the product to maintain the all-important flavour and produce exceptional results for consumers. Our modules are backed by the global Alfa Laval Support Service, which includes start up, and training, site audits and upgrades. The Alfa Laval Dealcoholization Module is an innovative combination of Alfa Laval technologies working together as a well integrated system. The fully automated module makes it easy to remove alcohol from beer at low temperature and pressure using a single pass through a vertical stripping column. The beer is first degassed, with any condensable volatiles returned back to the beer stream. 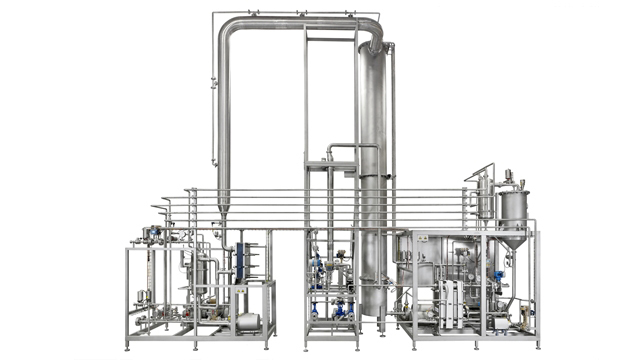 The alcohol present in the flow of feed beer is removed in a special vertical stripping column that enables high desorption by flowing a stripping gas (culinary steam) up a tower of densely packed material (proprietary to Alfa Laval) under conditions that are close to a vacuum. The material optimizes the stripping process by maximizing the effective contact area between the beer and the stripping gas. The production capacity is set by regulating the incoming beer flow prior to routing to the liquid distributor at the top of column. This distributor then disperses beer into the column, where it trickles downwards against the flow of the stripping gas injected at the base of the column and rising up through it. The vapour stripped out of the beer consists of steam, alcohol and other volatiles. It vents from the top of the column to a plate heat exchanger, which cools the vapour into an alcohol condensate stream. A final vacuum phase removes any remaining non-condensable volatiles. A glycol-side recirculation pump minimizes any risk of the stripped vapour stream freezing during condensing. One key benefit of this stripping principle is its exceptionally effective alcohol removal at low temperature and pressure. There is no need for recirculation to achieve the required specifications for the final dealcoholized beer. The system includes a recirculation loop if any additional stripping is required. Stripping efficiency can also be boosted by regulating the temperature of the beer before it is passed into the column, or by altering the pressure in the system. This fully automated, energy-efficient module provides reliable single-pass alcohol removal using an exceptionally effective stripping principle at low temperature and pressure to keep operating costs at a bare minimum. You can read more about the efficiency, practicality and technical details of our beer dealcoholizers by downloading the brochure. Low and no-alcohol beers are set to make significant inroads into the mainstream market. This will give rise to important choices and challenges with respect to flavour, technology capabilities and cost-effectiveness. We understand the process of removing alcohol from beer. Get in touch with us and let’s discuss the possibilities for your brewery. Any questions about DeAlc or this page? Please contact me. There is a steady, substantial and global move towards beers featuring less alcohol. Some brewery experts reckon that by 2020 as much as 20% of all the beer sold will fall into the so-called “healthy” category. For “healthy”, read “with alcohol content removed”. But how can one use the removed alcohol? Whether you brew the biggest brands, or the latest craft beer style, Alfa Laval can help you differentiate and expand.